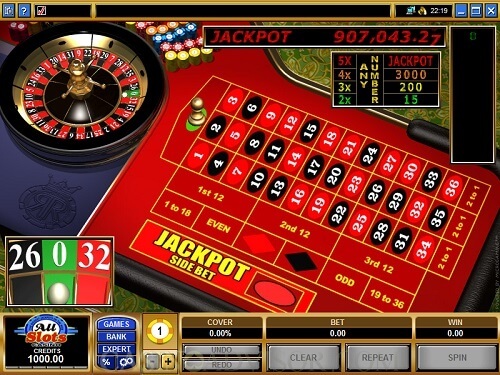 Royale roulette is one of the many versions of roulette that are based on the European form of the game. But this game is not like any other roulette game you have played before. The reason South Africans have come to love the game is not only because it was designed by a leading casino games developer Microgaming. This game is unique in every sense of the word. Only the core of the game remained untouched. The rest of the game is infused with special features which make the game more fun. And more rewarding. We can spend time discussing how to play roulette. But that would only be repetition. There are entire pages dedicated to both the European and American versions of the game on this site. So it is a better use of your time and ours to mention the things that make this game so outstanding. A quick description for those that do not know anything about roulette. The game is played with a roulette ball, roulette table and roulette wheel. Bets are placed on the table while the ball and wheel determine the winning bets. The table has numbers that correspond to the numbers on the wheel. For this version there 37 numbers to bet on ranging from 0-36. The game is part of a group of special games from Microgaming. These games are characterized by great graphics and animations. The roulette table and the ball spin in a smoother manner than most of the other casino games. Players are offered a selection of chips that is unmatched on any other game. This game gets more engaging when the player selects to play against bots. When players start playing the game for real that is when they realise the superiority of the game. The game adds a 500 bonus daily in a unique feature which is not the best feature. Royale Roulette is linked to a progressive jackpot. This jackpot is won when players get wins 5 times in a row. There are consolation prizes for players getting 4, 3 and 2 wins in a row. These prizes are 300 credits, 200 credits and 15 credits respectively.